Later that day I had a long discussion with the man pruning; he told me that rats like to live in untidy palms, the ones with the dead fronds hanging down; they enjoy the protection from the elements and the close food source that unwary humans provide. To forestall this, the trees must be pruned twice yearly. Chilled, I spent the rest of the day grateful for Jean Pierre’s garden diligence. That night sitting at an outside table at The Blue Plate Oysterette, watching the sun slip behind the forty-foot King Palms lining Ocean Avenue, I idly relayed the conversation to my husband, Jamie, as he perused financial statements from the studio. The idea so captured his imagination that for the entire time we lived there – literally, until we returned to the East Coast – every time we passed a palm tree he’d grab my arm and yell “rat!” At first it creeped me out, but since I never saw one, eventually I concluded that there couldn’t possibly be rats in every tree. Nevertheless, those invisible rodents remained secreted inside a small, dark sliver of my mind and I cut all palm trees a wide berth . 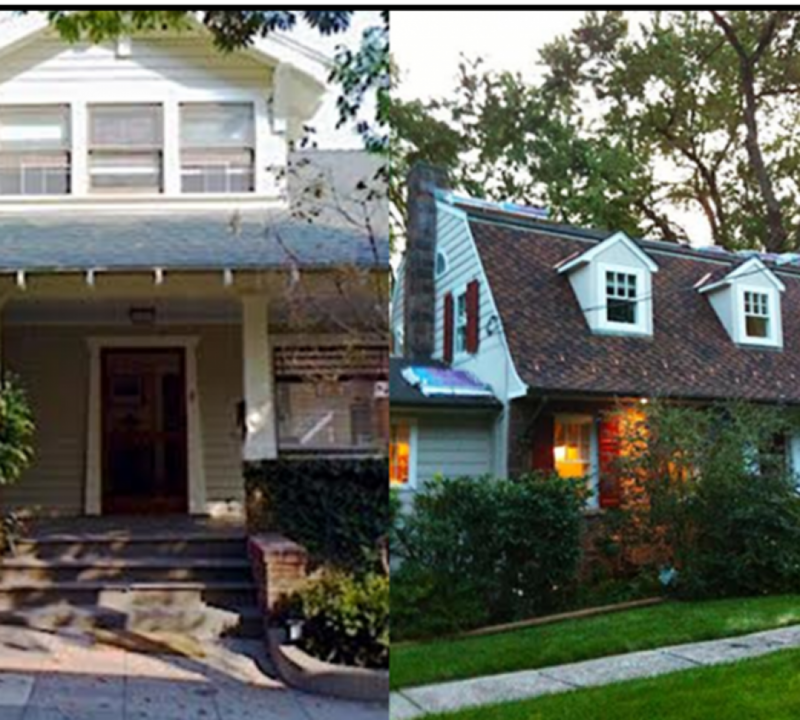 Ours is a small house, a landmarked turn-of-the-twentieth-century beach cottage, barely ten feet away from an identical landmarked house, across the paved walkstreet that forms the center spine of the historic bungalow colony. If that long-expected rat had appeared, he was sprawled on the porch roof, really close, maybe four feet away from the mattress. I slid Spencer, our marmalade tabby, off my lap and faced the windows; approaching warily, I poked one finger tentatively through the blinds. Peering through the slats, I saw that something sat in the center of the pitched porch roof; it was sleek-looking with a long slender growth from one end, too sleek-looking to be a rat, even one in overly groomed LA. And while it was kind of rodenty in color, it appeared to have a red stomach. Was it a bloody rat? Grabbing a long plastic back scratcher I yanked at the blind cord, then slid up the window sash and leaned out. I poked at the object with the scratcher. With a clunking noise, it rolled over and displayed more of its red stomach. Feeling somewhat safer – rats don’t generally clunk and roll – I leaned out farther and tried to drag it toward me with the curled end of the scratcher. It turned and clunked again, this time toward the edge. Leaning out so far I feared tumbling out to join it on the small rooftop, I swatted again. This time it caught. I reeled it in. 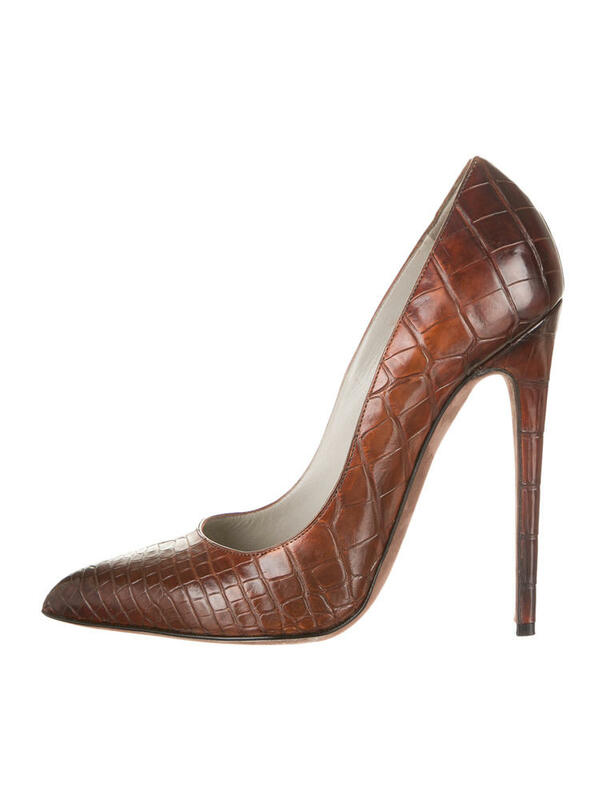 It was a brown alligator Christian Louboutain stiletto. Once I had the window closed, I sat on the rug examining my catch as it dangled expensively from the scratcher’s curved end. It caught the light dully on its sable matte finish. I lifted it gently and placed it beside me on the pale carpet. It gleamed; it was a left pump, its sole smooth and crimson, not yet scratched from use. He glanced up distractedly and nodded. Perching on the edge of the mattress I twirled the shoe by its five-inch spike heel. “How would this get here?” I mused. “It’s expensive. It’s alone and they come in pairs. It’s big, too, look . . . size . . . oooh, eleven. Wow. And, anyway, they can’t fly, so how . . .” My voice trailed off. Jamie looked up from the Marie Callendar commercial and jerked his head to the right. “Her,” he said. Her Across the Walkstreet was an Oscar-winning actress known to the tabloids as America’s Sweetheart, a Chiclet-toothed girl-next-door, who earned tens of millions of dollars for every movie she made. None of the neighbors knew her any better than the average reader of Star or People because, while she and her manager-husband owned the bungalow opposite ours, they rarely stayed there, since they also had an estate in Malibu and another in the Palisades. It transpired that our neighbor – America’s Sweetheart – possessed the interpersonal communication skills of a thirteenth century Mongol. Whenever she didn’t get her way she threw a screaming tantrum. “Threw” appeared to be the operative word, too, because a shoe often accompanied the shriek; she wound back and hurled, although with less precision than enthusiasm, apparently, since no one had admitted to seeing her husband with a black eye. And as our house sat immediately opposite theirs on the narrow walkstreet, the shoes landed most often on our porch. “How?” I envisioned his knocking on the door and bowing, ‘Your shoe, madam’ like some Post-Modern Hollywood Sir Walter Raleigh. I considered. Fill them with lemonade and freeze them, making shoe-shaped granitas. Plant them with dill and tarragon for a fashionista herb garden. Amusing, yes, but highly impractical, and nothing that my husband would have thought of. “Okay. I guess.” Somehow it seemed wrong to throw it again, so I carried the shoe to the narrow staircase and descended into the inky darkness. I wasn’t sure I wanted to return the shoe, although I certainly couldn’t formulate a reason for keeping it. It was . . . associated glory, of sorts, like bidding on a star’s detritus at those Hollywood auctions Julien’s in Beverly Hills was always promoting. This shoe was my own little brush with celebrity, except in this case the celebrity’s Us Magazine life had been found wanting. Stars! They’re just like us! They feed their kids and phone their therapists and argue with their spouses, but their nameless neighbors have to help them find their matching shoes after they have pitched them across courtyards. A tiny part of me wanted to feel morally superior and be sorry for America’s Sweetheart, as though my life was somehow more meaningful than hers – after all, I didn’t throw shoes – but I couldn’t quite manage that level of hypocritical envy. Regardless, for the first time I considered that beneath the great clothes and red-carpet events it must be pretty weird to be her. She may well do all those real-people things but she does them with an aging Sober Life Coach rolling along behind her and guiding her hand while a phalanx of photographers angles to capture every misstep for posterity. No, she is nothing like me. I teach high school English and worry about rats in palm trees, not rats clutching cameras waiting patiently for the unflattering money shot to define me to all of America. I sat in the darkened living room thinking until the entire colony was silent, then gently opened the door. I tiptoed across the paving stones and lay the shoe on the doormat. Treading softly down the wooden steps I gazed up at Jean Pierre’s palms wondering how many eyes were observing me as I completed my stealthy mission. However many there were, it was fewer than the number that watched my neighbor park her Prius in the Whole Foods parking lot. Maybe all the rats in LA didn’t live in the trees. Too bad she didn’t throw the other – I share the same shoe size!